European industry has outlined the basic design for a robotic probe that could be dispatched to the Moon's south pole in 2018. The 800kg craft would demonstrate fully automated landing technologies and place some environmental experiments on the surface, including a mini-rover. The mission proposal will be discussed by national space ministers when they meet in Naples, Italy, next month. They will be asked to approve further development costed at about 100m euros. Full implementation – the construction of the lander, its launch and surface operation for six months - would probably total 500m euros (£400m), but any final approval would not be given before 2014. The Moon lander is a project of the European Space Agency (Esa), and is being run out of its human spaceflight directorate. Its science is therefore geared towards the needs of future astronauts. Experiments would probe the soil for signs of resources that could be exploited by humans on the satellite’s surface. Instruments would also assess the environmental challenges of operating on the body, such as the dangers posed by radiation and lunar dust. An industrial consortium, led by the German division of Astrium, Europe’s largest space company, was asked to scope out the basic concept for the robotic mission. This so-called Phase B1 study listed the technology requirements, and initiated some early development work and testing. It also priced the full project – a key piece of information for ministers when they deliberate the next phase at their Council gathering on 20-21 November. The Phase B1 work concentrated on the major technologies needed for landing. Engineers want the vehicle to scan ahead for possible hazards (boulders, craters, steep slopes, etc) in the final 90 seconds of the descent, and be able to take evasive action if a dangerous obstacle looms into view. The required visual navigation technologies are currently under development at the German space agency’s Institute for Space Systems, in its Tron (Testbed for Robotic Optical Navigation) facility, in Bremen. Likewise, landing leg design is being investigated in the institute’s Lama (Landing and Mobility Test Facility) laboratory. Work on the propulsion system that will take the probe down to the surface has been conducted at Astrium’s Lampoldshausen centre. The robot lander will have an array of pulsed thrusters on its underside. "To be able to go down on the thrust of the engines, to recognise the terrain during the descent and make lateral moves if required to make a soft and precise landing is, for sure, something we need at the Moon. But these are also technologies we would like to use at other planets,” said Dr Michael Menking, senior vice president for orbital systems and space exploration at Astrium. The spacecraft would be targeted at the lunar south pole because it has locations that enjoy extended sunlight. This is necessary because Europe does not possess the radioisotope space technology capable of generating the power and heat needed by robots to survive long periods of darkness. One possible landing site already under discussion is a plateau known as Leibnitz-beta, which is just north of Shackleton Crater. There, the Sun stays above the horizon for months on end, explained Dr Peter Kyr, Astrium's head of robotic exploration and space robotics. "At the south pole, theoretically, you have some 'eternal sunlight'. But, OK, you have a topographic horizon so you also have shaded areas and we are not allowed to stay too long in a not-illuminated area. "We have the capability to stay in darkness for two days, but then we need sunlight to recharge our batteries. "Hazards for us are rocks, craters and slopes – but also shadows," he told BBC News. 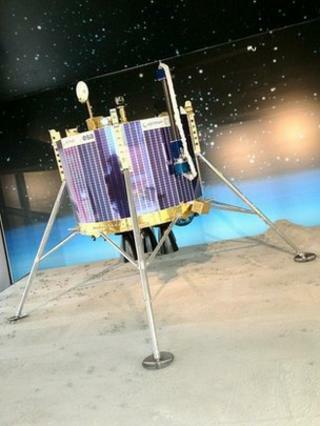 The Moon lander will be just one item on a long list of projects up for consideration at the ministerial meeting. Of Esa’s 19 member states, Germany has so far been its main proponent (funding 70% of the B1 phase), with lesser participation coming from the likes of Portugal, Spain, Canada and the Czech Republic. France, Italy and the UK – three major funders of Esa activity – have yet to put their weight behind the concept. Their interest and participation could be a decisive factor in how far and how fast the lander project progresses. Given the pressures on the European economy currently, ministers are inevitably facing some tough choices as they try to set Esa’s priorities for the next few years.